It’s Cookie Cutter Christmas time!!! Ok I know I’m always a day late and a dollar short but my stamp club is creating a Christmas layout tonight using the fabulous Cookie Cutter Christmas from Stampin’ Up. It’s time to finally get those pictures scrapped! I mean you’ve developed them right? No? Well today’s the day! Hop to it. I used a palette of early espresso, real red and crumb cake along with some designer series paper. 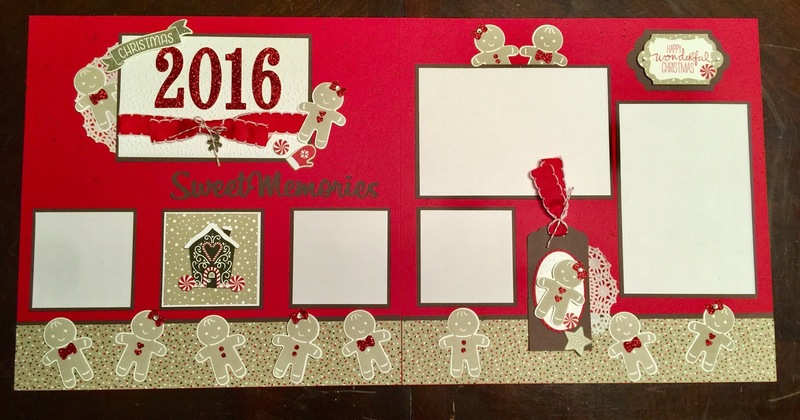 This layout uses a bakers dozen of gingerbread men stamped in crumb cake on whisper white and embellished with real red glimmer paper and a few rhinestones. I think they are just adorable! Makes me think of baking with my children. The photo mats are all backed with early espresso to make them pop. If you have any questions feel free to ask and if you are in central Arkansas and would like to take a class sometime let me know. « Flurry of Wishes box card, now I’m ready for some snow!